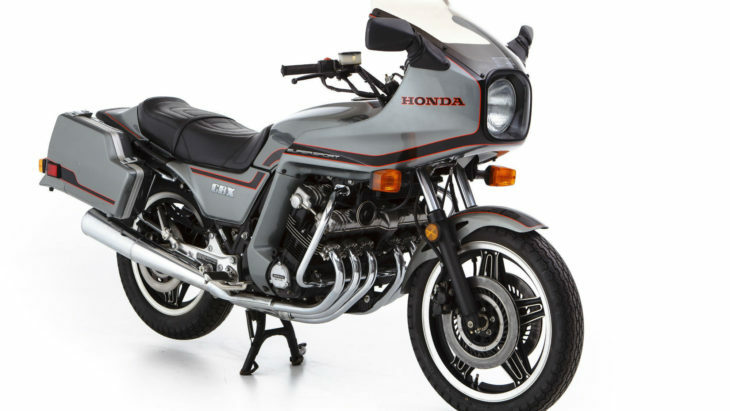 If you are old enough to have appreciated Honda motorcycles in the 1970s, you undoubtedly remember the six-cylinder CBX (there is a picture of one at the bottom of this article). A patent application reveals Honda may be about to introduce a similar model. 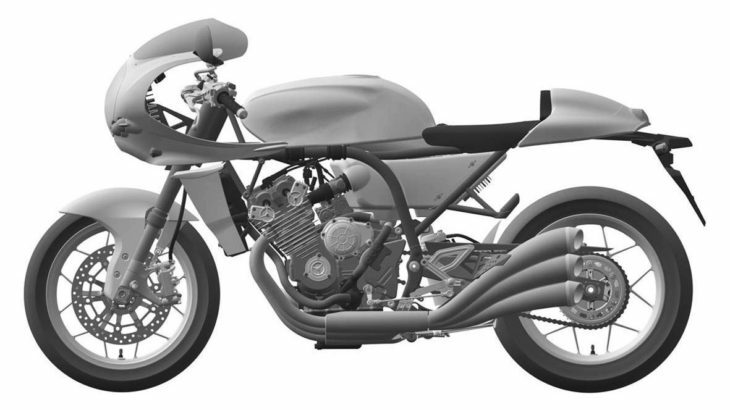 This Auto Blog article (itself referencing Motorcycle.com) indicates the Japanese patent application contained these drawings depicting something that looks like a late 70’s CBX with a sprinkling of design from earlier six-cylinder race bikes. Will we see something like this from Honda at the Fall motorcycle shows? Stay tuned. I’ve had over 40 motorcycles (must be edging close to 50) in 46 years of owning and riding them. Current selection of roadies includes Ducati Diavel, Harley Wide Glide, Triumph T140 and MV Agusta F4…. I have regretted selling very few of the bikes I’ve owned but two of those would have to be my Kawasaki H2 (2 stroke triple) and the early model CBX1000. Mine had fairly rowdy six into twos on it and sounded like a grand prix car with (only just) mufflers. Surprisingly torquey, not too heavy when you are used to HD’s and just a fun thing to ride. No, not the fastest thing outright, the brakes were uninspiring and the suspenders were typically 80’s (nothing to write home about). Loved it. My friend I sold it to still has it. If the price of this new version is somewhere this side of the stratosphere and the riding position no more masochistic than my F4, I will be down at the dealer’s as soon as it is released. Life is too short to drink cheap beer or ride sensible motorcycles. I rode 79 CBX friends and my 79 750 piped and jetted was as fast. CBX was a novelty and as someone else commented on cylinders 3 and 4 had heating problems. Good looking good sounding but SLOW! Ah..the HONDA CBX. You had to have been there in the summer of 1978 to appreciate this machine. Purchased my ’79 CBX in August 1978. I’ll never forget that warm summer night in upstate NY riding it home and thinking, what the heck,you’ve got to be kidding me. What a bike. The look,the sound,the Six hanging pipes,the gauges,the abundance of aluminum parts everywhere. What a work of art and has to be one of the coolest bikes ever built. I feel very blessed to experience the CBX back then. Notice how much a clean ’79 fetches now? Brother had two, I agree with your assessment. Didn’t matter that it wasn’t the fastest bike at the time. Their sophistication and sound were surreal. A pleasure to go riding on. Brother owned two CBX’s. Didn’t matter that they weren’t the fastest or best handling liter bike but visually and aurally the most pleasing for many. Sounding much like a Porche 911 at lower rpm for around town work, rising to a banshee scream when given the whip. Unless really pushing it, handling manners were fine but you knew your limits. Even though at the top of Honda’s sportbike lineup for a bit it was really just a very pleasing bike to ride. Its weight melted once underway leaving one to simply soak it all in with the senses. If you’ve never had the chance don’t pass it up! Worked in a Honda dealership back in 1979, I was the set up guy. Very first red CBX they received, the customer wanted the GP kit(bars, cables, foot pegs),and a 6 into 1, I believe it was a DG, but it was a long time ago! I think it took me two days to put those parts on. Got to ride it around the block. Pretty impressive, never saw or heard anything like it at the time……. BMW has one in production as we speak. Go to a dealer and see for yourself. BMW was still making boxers, while not that bad a bike I liked the R100RS, when Honda came out with the first CBX. 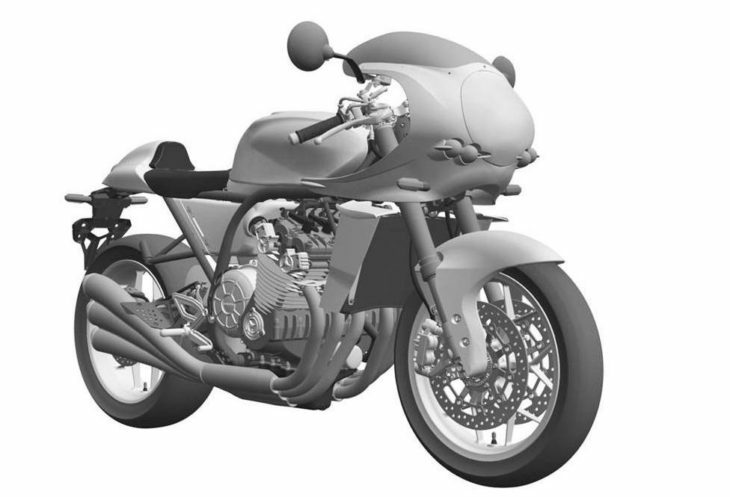 This seems to indicate Honda might make a retro CBX, like their CB1000. Saying BMW has one in production, are you trying to say, BMW has a retro Boxer looking bike? or that BMW has a Retro looking 6 cyl? or just saying BMW has a 6 cyl bike, not understanding the story printed above? probably the last huh. back to sleep Mark. The bowing to Sochiro story is an Internet fantasy. It was Yamaha’s long time association with Toyota that backed them up and got them through the really tough years of 83 to 85. Yamaha at that time was making nearly all of Toyota’s DOHC engines and through that won the contract to build Ford’s SHO and other engines. Here in the States we had a huge over supply of bikes in the warehouses that took until the end of the 80s to clear but that didn’t keep the company from coming out with some fantastic models like the FZ750, FJ11/12 VMX12,FZR400/750/1000 etc. Thanks. That story pre-dates the web, BTW. Your version makes more sense. And ditto, Yamaha was certainly releasing some great, innovative new machines in that same era. Even though the ’82 Vision had single disc and shaft drive I still preferred it over the GPz550 and GS550. The Vision motor was among the all time smoothest, and had much flatter, taller, and wider torque curve balancing a little softer top end. The narrow rev range where the 4’s made more power on top was that of maximum vibration. I owned a GPz and rode the GS. From what I read of the VF500 (first year ’84), it makes great power but still can’t touch the Vision’s torque curve. I suspect I would have preferred a well sorted chain drive Vision over even a VF500 and Kawasaki 600-4 of that era. For those not familiar, the Vision is a V-Max motor vertically cut in half and in higher state of tune. A friend has a 1980 with a big bore and a Yosh headerand mag .We uncorked the thing and gave some speed runs on the road .Wow , what a sound of beauty , you could her it sing for mile away . On a fifty mile ride to work around the inner highway ring of Boston I saw ONE motorcycle, a Speed Triple, and thousands of cars. We sure aren’t riding in the Northeast. – A six is expensive to produce. Just an attention getter? Trying to beat the other cafes out there for coolness? It would be a fun machine and sound good. Low production numbers. – Gas is also rising these days so not sure how a 6 fits there. Not sure how Obama kept prices low, but he did. It is a relaxing, serene experience to drive a CBX on a dark deserted road at 50 mph. When you just want to enjoy the ride and not worry about winning a race, the sound of the engine is very important. Besides the CBX, and other 6 cylinder motorcycles, the RC51 with it’s gear drive cam whine and the crossplane crank R1 are wonderful examples. “Honda 250 six” Plenty of isle of man videos. “Sonido Honda RC166” …the audience is quite revealing. I wish I were there. Read about RC166 and its brethren for fun. They broke new ground, I think. The cams are thinner towards the outer cylinders, with smaller bearings on the way. Tapered as carry less twist load. (I read Kevin Cameron) Every tiny point worked out. A fun research engine put into racing duty. Because Mr. Honda liked it and liked racing. A very good epoch changing CEO. The bike above could be a real hoot for people with extra $$$ to spend. Won’t have 18k redline, but it would for sure if Honda wanted it to. 12k is plenty for this version, I suppose. The RC 166 was all about the engine. This will have a good chassis. Somebody else figured out how to get the radiator under and behind the seat. A New Zealander. Wonder why it never caught on. What started the trend of elevating mediocre bikes to sainthood? The cbx sold well in the first year but fizzled when the novelty faded. The xs650 and sr500 were vibrating slugs. The new cb1100 resembles the second gen cb, which was less good than the sohc. Nostalgia by people who owned them, or dreamed of owning them when they were still in production. Fred_M describes me. I just bought an 2015 SR400, which is the 37th? year of production? It is a throwback to the pretty bad but then-aspirational Gold Star, produced 1930s-1960s. A modern CBX would not be cheap, would have better bits. I would want air cooled but am not being asked. I think air cooled is why SR400 is now discontinued. Being air-cooled was one of the CBX’s downfalls, the inner-most cylinders would get too hot and cause issues. That, plus the afore-mentioned issues with carb synch’s, lower-than expected power output, etc., hurt as well. I remember reading reviews at the time and the test riders pretty much crowned the Suzuki 1000 (and later 1100’s) the go-to machines for street performance. There was a lot of brand-loyalty in those days (mine was Yamaha). The early 80’s ushered in a really bad recession, my guess is that it hurt superbike sales as much as anything else (double-digit unemployment, double-digit inflation and interest rates, etc.). It was a great time to have a lot of cash (money-market funds were paying 17%, if you bought long-term treasuries you cleaned up in the following years). Conversely, it was a really lousy time to get a mortgage or borrow money for anything else. I gave up looking at finding a good-paying job after being laid off and went to college – looking back, that turned out to be a good thing for me personally. That recession really hit the middle-class hard, unionized workers took it in the shorts, especially those in trucking – it was really a watershed period in American history. That Suzuki people glowed about was a POS. Owned a ’78 GS1000. Because of it being a roller bearing crank, apparently it was easy to twist it. Just ask me. I did it and the bike wasn’t abused. Took it back to the dealer to take it out and weld it. Will never own another Suzuki. The CBX was released at a time when the Japanese Big 4 each released a new superbike in 4 consecutive months. The CBX made more power, was quicker in the 1/4 mile and had way more soul. Bike sales, including the CBX, do not occur in a financial vacuum. A world recession hit, of epic proportion and longevity, soon after the CBX arrived. How big a recession was it for the motorcycle industry? First, as most reading this know, no one ever “needs” an open class street bike (then called “UJM”). Second, Yamaha picked the worst possible time (late 70s/early 80s) to make it their goal to overtake Big Red as #1. Yamaha’s almost fatal chosen method was to simply make more motorcycles than Honda or anyone else. Yamaha turned up the production volume to 11, followed by the above mentioned world recession. The result was Yamaha selling NOS ’80 through ’84 models discounted 35-50% through the late ’80s (I know, I bought two). Per an unconfirmed story, Yamaha was about to be sold to the scrap heap of history. Yamaha’s motorcycle CEO bowed low before Soichiro’s throne, respectfully requested absolution, and Honda responded with a loan that kept the grim reaper off Yamaha’s door step. Honda had a few NOS models collecting dust in the 80s (such as the gorgeous and heavy weight 650 Turbo), but nothing like Yamaha’s ginormous garage sale that lasted for years. Imho the reason d’etre for the 45 ‘ Vtwin in the 1910-1920s was that the intake ports were very close together. This allowed HD to use a single carb. 60 years later, this feature came back to save the company. Emissions standards for bikes started around 1980. The response was to use vacuum diaphragm carbs. A steel spring balanced against air pressure. The slightest leak or blockage would upset them. HD had diaphragm carb, but only one. And many aftermarket options. The four carb setups were constant hassle and worse bc of lean jetting. You speak ill of that which you do not even approach understanding. The CB/X was not mediocre. What’s going on there on the top-outside of the head? The little assembly at all for locations? Surely not something to rotate the cams for variable timing? Ducati. Are they good on that point? Is it Jim Redman Honda 6 tribute? One year, at the Indy GP, a fellow had a spectacular CBX that he had built up. It had a single sided swingarm, had a breathed on engine and was red in color. It was a beautiful piece of art, if there ever was one. I had a buddy that had a white CBX that was dressed like the gray one in the article. It was pristine and glowing in the early 80’s but he got short of cash and sold it for $2500. He doesn’t like talking about it but I wonder what it’s worth now? I had a white ’82 CBX like your friend, and like him had to sell it due to financial needs. They’re worth about $6500 on up, depending on condition. Best-sounding (to me) engine that I have ever heard. In high school, we had five white/ red-blue pinstripe CBXs that Honda gave the school. Four of them were never touched, under covers. One had been disassembled and reassembled 1000 times by students. After ten years Honda asked for the VIN numbers back so I helped load the bikes on a scrap trailer to be destroyed. Their number-stamped frame heads and engine castings chunks were to be returned to Honda for proof. Sad day. When Honda built the original CBX, they were showing off their engineering might. It was a statement saying, “look what we can do!”. Today, it just comes off as gimmicky, or at best, overkill and unnecessary complication. I happen to like the styling, but a 4-cylinder 1000 would be plenty, thank you. most customers for large sport bikes felt the same way. GS1000 is a better bike, capability wise. I wish someone could and would explain the potential link between the word “patent” and a motorcycle approximating that represented in the CAD renderings. What on earth is there to “patent?” My admittedly limited patent research comprises clarifiers such as “unique.” Yes, the rendering comprises style elements of earlier Honda race sixes, but as at least one other poster mentioned, such bikes mimic a European maker’s earlier race six-cylinder. So styling seems to fail patent requirements. I can’t imagine a patent granted for a transverse inline 6-cylinder engine, currently employed by BMW. HD’s earlier attempt to patent their 45-degree V-twin firing order (and unique sound) miserably failed. Re. the bike itself. Down: performance wise, the extra two cylinders widen the engine and increase weight. May have smaller than ideal bore relative to stroke to minimize cylinder width, which decreases maximum RPM. I’ll ignore potential cost/complexity negatives because the demographic won’t care one whit about such things. This is halo bike and not much else. Up: chance of passing another one on the street nill, but then again, many of these shall be most often parked. Compared to a 4, 50% higher rate of combustion per crank stroke increases power per liter. If you’ve not ridden a very finely tuned CBX, you just have no idea of this bike’s raison d’etre. Honda’s 1047cc CBX was smoother throughout its range than my 700cc 90 degree V4 (respectively the 1st and 2nd smoothest motors with which I have experience, the 3rd smoothest being Yamaha’s 550cc 65-degree V-twin). The CBX’s combination of power, torque, and lack of engine vibration is still unique to this day. The CBX motor has a hit around 6k, maybe a little softer than Kawasaki’s first-gen KZ900 series (both of the 6-cylinder’s curves are greatly magnified, of course). The best CBX I rode was a black ’80 with OEM Sport kit (rearsets, half-height forged clip ons, shorter cables and electrical connectors), 6-1 Denco header, jetted and tuned to perfection (stock air box), fork brace, S&W progressive rate shocks. Idling at stop lights, blipping this bike’s throttle borders on orgasmic, as does revving through the gears, shifting at any RPM. The aural shriek + glass smooth motor is simply beyond comparison to any bike with less cylinders. Yes, the fork makes the bike wallow when pressed, as you’d expect (I’m curious how the frame reacts to a non-flex fork upgrade). The thought of an injected six with similarly smooth motor, with similar or better power and torque throughout, with less weight (CBX was over 550 lbs IIRC), with current race replica suspension, and looks and sound to die for, seems like a low risk bet for Big Red. I estimate the weight penalty v. liter sized race replicas is only 30 lbs, reasonable for the unique, visceral riding experience, and pride of ownership. Collectors shall have a tough time resisting this bike. Honda may require potential buyers to register and purchase online, only using the local dealer for final delivery. Very curious what may be the final and total production numbers, both worldwide and for US delivery. Estimate $20k firm SRP for this bike if it ever exists. Hey, you can’t take it with you! If I was a dealer, I’d have a very high grade set of headphones to play back the motor revving. Honda, or anyone reading this: for the absolutely best and most realistic audio recording, use Sennheiser’s $300 binaural stereo around the ear microphones, which require playback on headphone only (speakers ruin the binaural effect). Not sure about Japan, but in the US there are utility patents and design patents. Utility patents are for what we’d think of as inventions. They have to be new, not obvious, and useful. Design patents merely cover the appearance of something … and these drawings are more than enough to allow a design patent to be granted. I have recently discovered how fun a lightweight, single-cylinder bike can be. From now on I’m passing on bikes that weigh 4X my weight and concentrating on the other end of the spectrum. Nothing against this new HONDA 6, just not for me. Hope it makes the buyers of this bike happy. Honda CBX carbs do not need to be synced every year. $300.00 is what it might cost today to have a valve adjustment, yet modern sport bikes can cost well beyond that. Air cooling in my books is a wonderful application of artwork, still see so many liquid cooled motorcycles trying to mimic fins. The CBX is a statement of technology from Honda in the late 1970’s, not the fastest but still the statement. Yes I own one and unless you have ridden one it’s hard to understand. Modern tires and suspension components can make a CBX into a decently handling machine. I have toured and sported on mine and it is a pleasure to ride. A next generation CBX in retro trim would only appeal to a older and narrower minded gathering of riders, like me. Even when “out of sync” the intoxicating sound of not 1, not 2, not 3, not 4, not 5…but 6 cylinders, so overshadows it shortcomings. Just remember to close the petcock when sitting overnight! Potential “oh-oh?” on start up in the morning. Event “out-of-sync”… something very intoxicating about the sound of not 1, not 2, not 3, not 4, not 5…but 6 cylinders near redline that seemingly overshadows any imperfections in carburation. Just remember to switch the petcock “off” overnight. Potential for an expensive “huh?” moment at start-up. I looked at a CBX in 1979 and asked the dealer what it would cost to have 24 valves checked and he said $200. So I bought an XL500. I stubbornly believe more bikes should have hydraulic valves. Especially halo / retro / novelty / nostalgia bikes like this that are likely to see limited usage and potentially care. For the same reason, ‘fake’ carb FI (like Triumph) makes infinite sense. Both will solve many of the maintenance issues of a 6. I just don’t have the knowledge or the experience. Would someone please provide an explanation of why use a 6 other than on a big cruising / touring bike. Please. Because 6>4… This is not a rational engineering decision on Honda’s part and would not be a practical choice for the purchaser but it is awesome, will offer a unique riding experience, and will get people’s attention. Sound. Smoothness. Class. Cool factor. Don’t worry if you don’t get it. Even though sixes tend to be engineering showcases, they aren’t usually the ideal technical solution for motorcycles. In reality inline 6s were banned from racing because they are just too good. Two-strokes were lighter and more powerful but among 4 strokes a 6 is terrific at any displacement due to the valve area at any given displacement. An inline 6 cancels almost all vibration which is very important for high RPM operation so no balancing shaft is required. Horsepower is a question of RPM so an inline 6 will have very short stroke compared to a 4 permitting higher RPM. Gigantic engines like the Gold Wing or BMW are more in the 2 wheeled car category – enormously heavy, etc. If Honda builds this they could go with light weight and perhaps under 1000cc. This is Honda we’re talking about. It will likely be heavy and underpowered. Honda likes to tell people what they really want. And frankly, given that we are talking about a big inline six, that probably isn’t such a big deal. Even an underpowered big six will be plenty powerful. Ever ride a CBX? Sound alone says a 6 is a damn fine idea. Excess for sure but wow. I rode my buddies (he kept it at my place) and you probably could spend all day riding it bewtten tall buildings or in tunnels to hear that sound. I know that Jay Leno still loves his CBX. True. Used to see him regularly on his Black CBX at Ed & Vern’s Rock Store. I guess I have this bone in my head that makes me think that it’s a good thing that technological developments have shrunken engines and lowered cylinder counts. That same bone makes me think that this is not a shining example of the past that needs revisiting. The kids are in to the eighties stuff now. So make a nice V4. They do, its called a VFR Interceptor. VFR is still in production with an 800cc V4. More like the V65 Sabre… A bike that was too big for me at the time, but would love to have now.. This looks like a Rune-type halo bike to me. Honda’s been developing the “neo-cafe” styling with the CB300 and CB1000, this will be the culmination of that. Honda had six cylinder road racers in the mid to late 60’s. This layout was a copy of the MV Agusta that was dominant at that time. There is a gentleman who shows up to the local bike night with a CBX that is in immaculate condition. He says he loves everything about it, except for when it comes time to synchronize the carbs, which he does every year, and considers hanging himself every time. I’d be willing to bet that this would have his full attention. Sounds interesting, but I suspect the true performance potential will be seriously dumbed down in typical Honda fashion. It looks a lot like a Laverda to me. That’s the one which needs to be resurrected. Twins (ala SF750)made lot more sense. As others have stated, that’s not a late seventies. I think that those wheels debuted with the 10th Anniversary 1979 CB750L. I wish that I would have kept mine. I remember going to a dealer in 1969 and seeing the Honda CB750 for the first time. It seemed to be an exercise in wretched excess and for sure would never sell. When the six came along it was in defiance of everything I believed a motorbike should be. Oddly enough, several mechanics that I knew owned them. Then I finally got a chance to ride one and was amazed at the character of that motor. I still don’t want one but at least I get it. Four cylinders are more than enough with much less width and weight. I don’t buy it, even in retro style. The chassis pictured is totally insufficient. Would look at but would not ride, would not buy. I love my BMW K1600 motor. Smooth and torque from idle that most motorcycles never see. But it is a 700 pound motorcycle. Many have asked BMW to come up with a super sport bike with that motor. Maybe Honda will answer this request. I’d be interested in the machine if it were to look like that CAD drawing. Unfortunately Honda has always wet our appetites with bikes like the CB1100R (google it) only to serve us CXT700’s or DN-01’s. Based on my CBX experience: if this new CBX comes to exist, and if you heard it with a proper 6-1 header, you’d want to have this bike’s baby right there on the street. I hope they match the original’s 1047cc, for nostalgia’s sake. ’80: naked, red or black (latter looked absolutely bitchin), real SA bushings (big upgrade), fork similarly awful (IIRC 36mm while the lighter/lowered powered Suzuki GS1000 had 37mm), big item: emissions mandated softer cams with softer top end. ’81, ’82: bike as pictured, OEM “Sport” fairing also sold separately for other models, mono shock, different wheels and brakes, mono shock, likely differences in color, transformed from sport to sport touring, heavier, etc. While the rest of the CBX’s styling didn’t do justice to that big lump hanging down, the looks of that motor sure did impress. And that sound! I heard one with a header wind out in front of Duke’s in Bridgeview IL one evening, and I could have sworn I was at Indy, what music. They’ll have to get creative with heat rejection, that big radiator hides what needs to be the centerpiece of the machine. That engine configuration would almost fit best into a “muscle bike” chassis. A small mural of a one-fingered salute to a battery on the tank may be appropriate, IC’s last defiant stand before electrification eventually takes over. What’s being patented though? If it was a small component or two I’d think the drawing(s) would be of that, not the whole bike. Cam end covers look interesting, variable cam timing system? Where do I place my deposit for one? I been looking for a CBX but they are running 6-9k for a decent one, if this one can sell for 12-13k with modern technology, it would be a no brainer to buy one. The “regular” inline-four CB1100 is in the $12k range now. What would make one think that this would be any less than $16,000 or so? This is Honda we’re talking about. 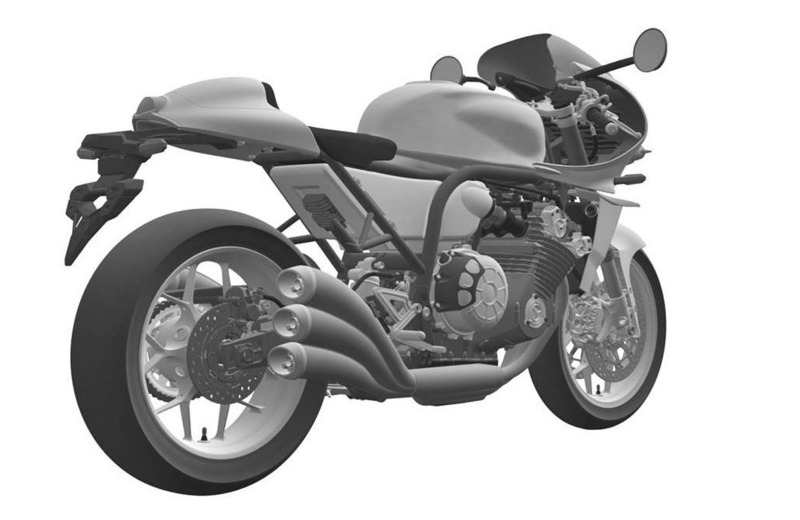 A $12K six cylinder halo bike won’t happen. I believe a 1981 or 1982 is pictured. Not a late seventies. It looks like they are going with a centrally located cam chain. A design that Kawasaki killed with one fell swoop with the Ninja 900 because putting the cam drive to the side allowed a straight shot for the intake and exhaust ports. Not that it makes much difference in non high performance applications and this iteration is certainly that, with the non downdraft intakes. Straight sixes sound sweet and provide a wow factor in bikes. Good luck selling enough of them to justify the development cost. The cam sprockets on the camshafts have twice the number of teeth as the sprocket on the crankshaft. As the camshafts got moved closer and closer together for a tighter included valve angle, the cam sprockets would touch unless they were made smaller in diameter. If you make the cam sprockets smaller in diameter, the cam chain sprocket on the crankshaft must be made smaller as well to maintain the same cam chain drive ratio. There is a limit on how small in diameter you can make a center-located cam sprocket in the middle of the crankshaft before the center of the crankshaft is too small in diameter for strength and reliability. Moving the smaller sprocket outboard to the crankshaft end solves that. Also makes the engine narrower.